Thanks you for your interest in working with Cezars International K.K. or one of its affiliates. With approximately 250 passionate professionals working throughout Japan, Malaysia and Korea, we are a great place to build a career. The absolute key to our success is having people who love what they do and are willing to work with energy and dedication. 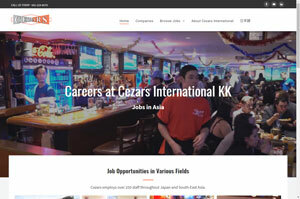 Cezars International KK was founded in November of 1996 in Nagoya, Japan. After years of successful operations and millions of customers served throughout Japan and Malaysia and other parts of Asia, Cezars International is still focused on providing the highest level of service to every individual. We are always willing to accept resumes and applications from dynamic individuals looking for a chance to grow within our organization. Our businesses provide opportunities in everything from front-line operational roles to executive level leadership. To see the various career opportunities we offer and to apply, please visit our own Cezars Career Portal.